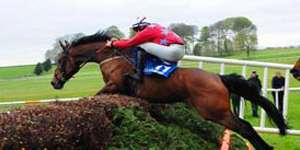 BALLINROBE Races are woven into the fabric of community and sporting life in the west of Ireland. It has a unique atmosphere. They come to enjoy the Races, but there is so much more to it than that. It is a gathering of the people, a chance to trade opinions and banter on a wide variety of topics. Will Galway beat Mayo? The state of the nation. The latest political crisis. The price of cattle. How is the fishing this year? Affairs of the world. All are discussed and dissected at Ballinrobe. Ballinrobe is located 30 miles from Galway City, and just six miles from the Mayo/Galway border. Less then 20 minutes drive from Lough Lannagh Holiday Village. The course has a rare rustic feel to it – Loughs Corrib, Carra and Mask are all located within a few miles. When you take your place in, or to the front of, the Grand Stand, you look out on a charming course. You can see virtually every stride taken by the horses as they jostle for victory. They run close by – but, crucially, not through – a Ring Fort as old as time. In the mid-distance, the picturesque Partry Mountains look on approvingly. Killarney has the Reeks and Sligo has Ben Bulben. We have Partry. And we wouldn’t change it for the world. There are few courses quite as scenic and as engaging as Ballinrobe. It is a day out for all the family. And when the horses come thundering down the finishing straight, and the roars or the groans tell a thousand stories, the ease with which the crowd interacts in Ballinrobe is apparent. Everyone mingles in Ballinrobe. The course has brought racing to the people of Mayo, Galway, Sligo, Roscommon and Clare for many years, and will continue to do so in the future. Later, they file into the local restaurants and bars to continue the day’s festivities. Still, will Galway beat Mayo, and how is the fishing? Ballinrobe Races are a rite of passage, part of what we are, and a piece of our heritage. And Ballinrobe Race Committee respects that heritage, and takes seriously its duty to preserve it, and to enhance it, for future generations. Ongoing developments at the track reflect that commitment.